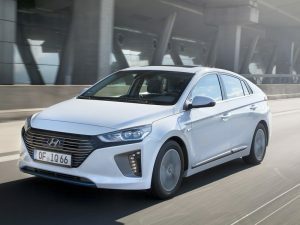 Hyundai’s Ioniq Plug-in Hybrid is to go on sale this month, joining the electric and hybrid versions and bringing pricing from £24,995 OTR (including £2,500 PICG). Ioniq Plug-in Hybrid offers CO2 emissions of 26g/km. Debuted at the Geneva Motor Show and providing a rival to the Prius Plug-in, the Ioniq Plug-in Hybrid combines the carmaker’s new 104bhp three-cylinder 1.6 GDI direct-injection petrol with a 60bhp electric motor powered by an 8.9 kWh lithium-ion polymer battery, giving a total 139bhp and married up to six-speed dual-clutch transmission (DCT). As a result, the Ioniq Plug-in Hybrid offers CO2 emissions of 26g/km – putting it in the 9% BiK bracket for 2017/18 – and giving up to 39 miles of pure electric driving, with a total range of 680 miles. It’s also backed up by Hyundai’s standard five-year unlimited mileage warranty package, with additional cover for the high-voltage battery of eight years / 125,000 miles. Two trims are offered – Premium and Premium SE – and standard equipment brings 16-inch alloys, Bluetooth, Apple Car Play and Android Auto, Smart Cruise Control, heated front seats and steering wheel, LED headlights and rear lights, wireless smartphone charging, and rear parking assist with rear view camera. In addition, an eight-inch integrated satellite navigation unit provides access to the ECO-DAS predictive navigation – a bespoke feature of the Plug-in Hybrid model that optimises the battery charge and discharge in line with route conditions. Pricing for the Premium SE trim starts from £26,795 including PICG and adds features including rain-sensing wipers, Blind Spot Detection and Front Park Assist, leather seat detailing, front seat ventilation, rear seat heating and an electrically-adjustable driver’s seat with memory function. Drivers can also opt for a POD Point 7kW home charger, priced at £300 including installation. The Ioniq Plug-in Hybrid goes on sale from 13 July through a dedicated network of 70 Hyundai dealers across the UK.